The Central Section championships are Thursday at Woodward Park in Fresno. 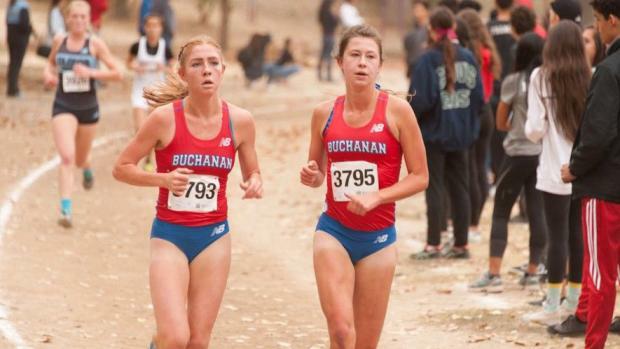 Buchanan is the favorite to win a third consecutive girls section title in Division I.
Buchanan (D-I), Monache (D-II), Ridgeview (D-III), Avenal (D-IV), Chowchilla (D-V) are the defending division champions among the boys. Monache (D-II), Bakersfield Foothill (D-III), Corcoran (D-IV), and Wonderful College Prep (D-V) are the other defending team champions among the girls. Here's a look at the top returning runners in each division based off of 2017 results. Buchanan senior Meagen Lowe is the defending champion after placing third as a sophomore. Junior Corie Smith was second to Lowe last year after winning the section title as a freshman. Smith is the defending DI State champion. Clovis senior Olivia Herrera was third last year and seventh as a sophomore. Smith went 17:05.30 on the Woodbridge 5K course as a sophomore and no doubt has the 16:59 section course record on her radar at some point before her days at Buchanan are over. Lowe has a course best of 17:18.30. How much effort the teammates and training partners put out here, or hold back for the Nov. 24 State Championships on the same layout, is uncertain. Stockdale senior Marcus Mota is the defending champion and was second as a sophomore. Clovis North junior Isaiah Galindo was second last year, 10.40 behind Mota. The team battle is up for grabs. Monache senior Ivan Mendez was second last year after placing fifth as a sophomore. He could see challenges from Liberty's Joseph Mikhail and Highland's Jacob Yager. Monache senior Marilou Ruiz was second last year, with Bakersfield Liberty senior Nickie Sanchez third, 13.10 seconds behind. Madera's Unique Ford could surprise. Ridgeview senior Bryan Gaxiola was second last year after placing ninth as a sophomore. But it's teammate Alex Cuevas who is the clear favorite here, coming in with the top overall 5K time in the section. There were no seniors among the top seven from a year ago. Sunnyside junior Jessica Valles is the defending champion. Wasco senior Sayra Raya was second, 18.60 behind. This year's race should again come down to these two. Lindsay and Central figure to battle for the title with Abel Teffra (Central) fending against the Lindsay duo of Lionel Aguayo and Victor Cisneros in the mix for first across the line. Lindsay senior McKaylie Caesar is the defending champion and clear favorite here. She was fourth as a sophomore. There were no seniors in the top five last year. Bakersfield Highland sophomore Haley Ulloa was second last year, 34.30 seconds behind Caesar. Bishop Union junior Rachel Fitt was second as a freshman and third last year. Central Valley Christian senior Garrin Schaap is the defending champion. He was third as a sophomore. Teammate Josh Dykstra, also a senior, was third last year and fourth as a sophomore. Chowchilla's Michael Eggert is not to be overlooked. Washington Union sophomore Caliska Avila is the defending champion. She was 39.80 seconds ahead of runner-up Marianne Gleason last year. Gleason, a senior at San Joaquin Memorial, won D-IV as a sophomore. --MileSplitCA editor Jeffrey Parenti contributed to this report.